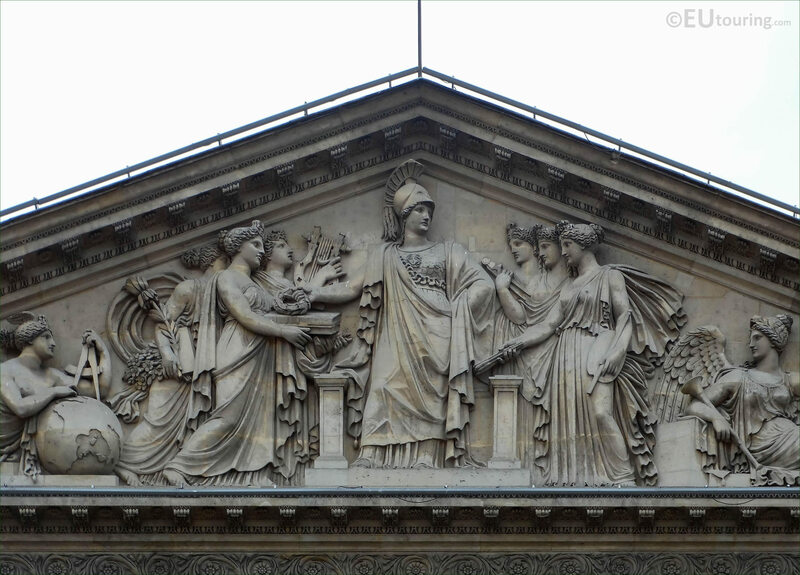 While we were at the Musee du Louvre in the 1st Arrondissement of Paris, we took these high definition photos showing a sculpture called Minerve accompagnee des Sciences et des Arts, which was produced by Jacques Lesueur. 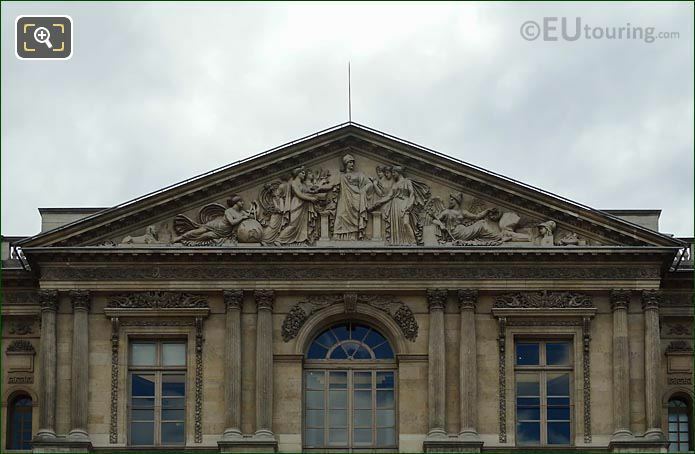 This first HD photo shows a close up of a top pediment that is entitled Minerve accompagnee des Sciences et des Arts, which is an allegorical sculpture that translates in English to Minerva accompanied by the Science and Arts. 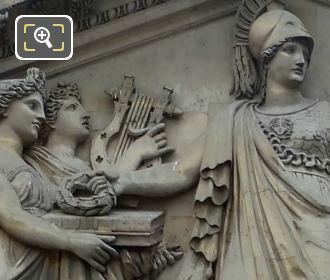 But here is an even closer view of the central figure, which was designed to represent Minerva, who was the Roman Goddess of Wisdom and a sponsor of the arts trade and strategy, with the name also coming from a term She Who Measures in Etruscan mythology,, and Minerve, as it is spelt in French, is also referred to as a Goddess of Music and poetry. 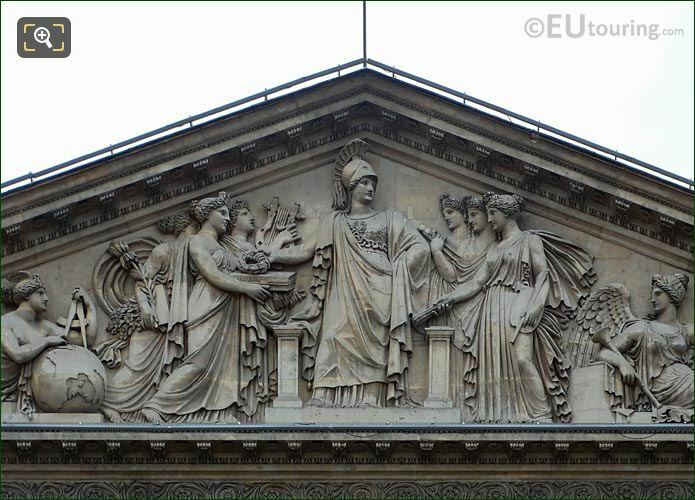 Yet here you can see the entire pediment of Minerve accompagnee des Sciences et des Arts, which was produced by Jacques Philippe Le Sueur, although he is often known as just Jacques Lesueur, and born in Paris in 1759 he studied to become a French sculptor under Francois Joseph Duret, gaining much recognition even at an early age. 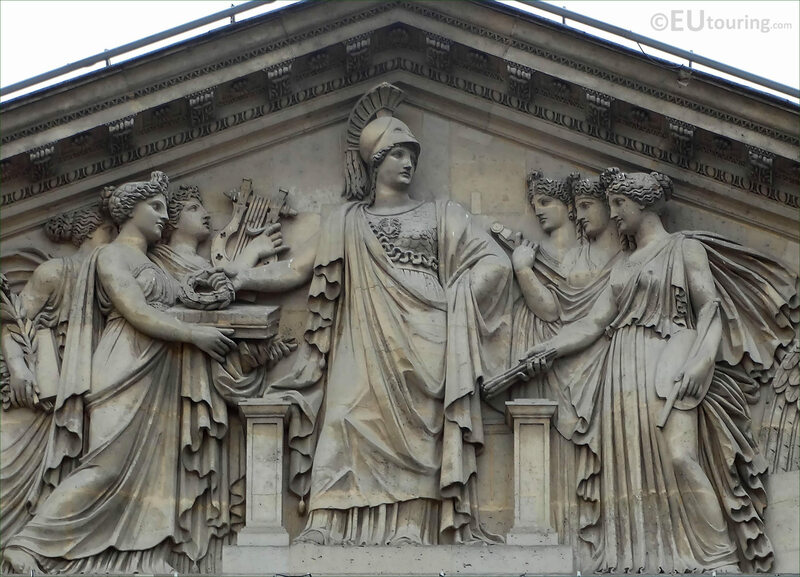 Jacques Lesueur received many public commissions including for famous tourist attractions such as The Pantheon, the Arc de Triomphe du Carrousel and of court this sculpture at the famous Louvre Museum, plus he was awarded the Legion of Honour two years before he passed away in 1830. 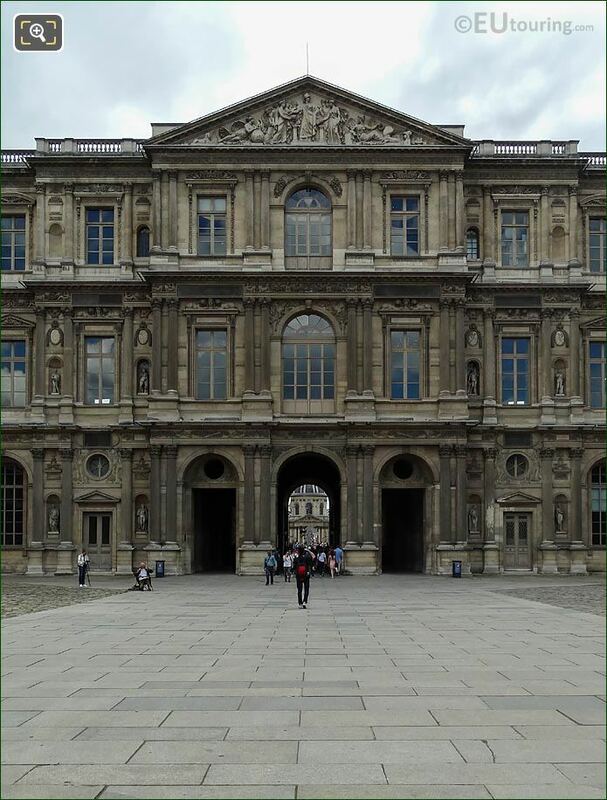 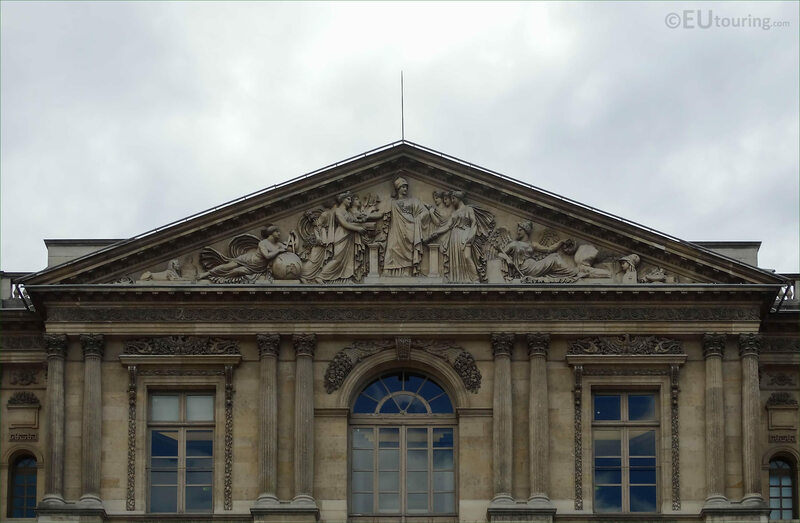 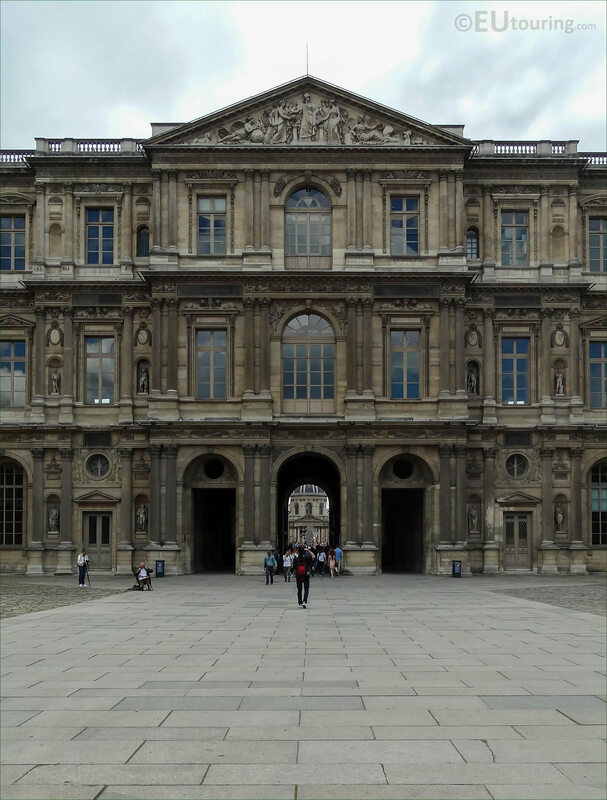 However, this photo shows the pediment sculpture of Minerva accompanied by the Science and Arts by Jacques Le Sueur located on the Aile Sud, which is a wing of the Musee du Louvre that you can see from the courtyard called the Cour Carree, and as the name of the wing suggests, it is on the south side closest to the River Seine.